Narrowly missed being sent to the landfill! 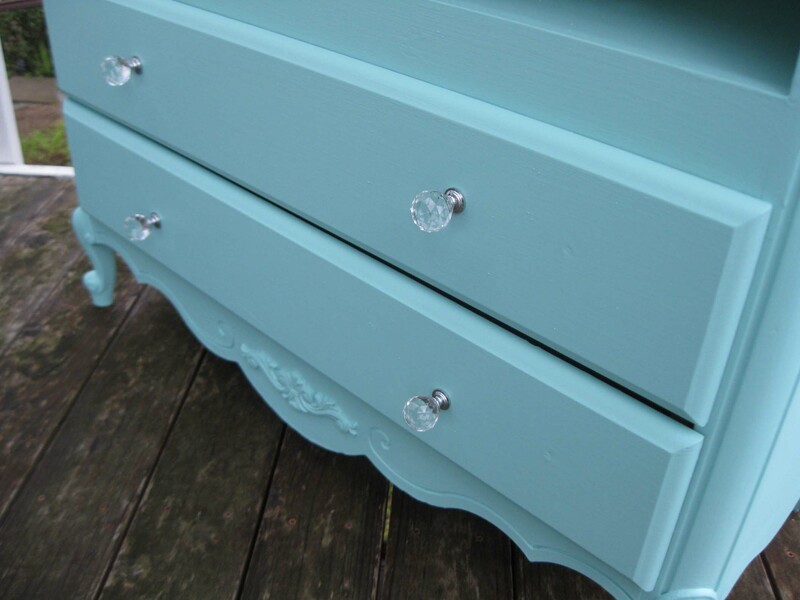 I bought some aqua paint (Clark + Kensington Good Life) and four faceted glass knobs, and then I got to work. Paint ($10, but free to me because Sean paid) + glass knobs (4 x $6 each) = A damn good deal for the final product, if you ask me. 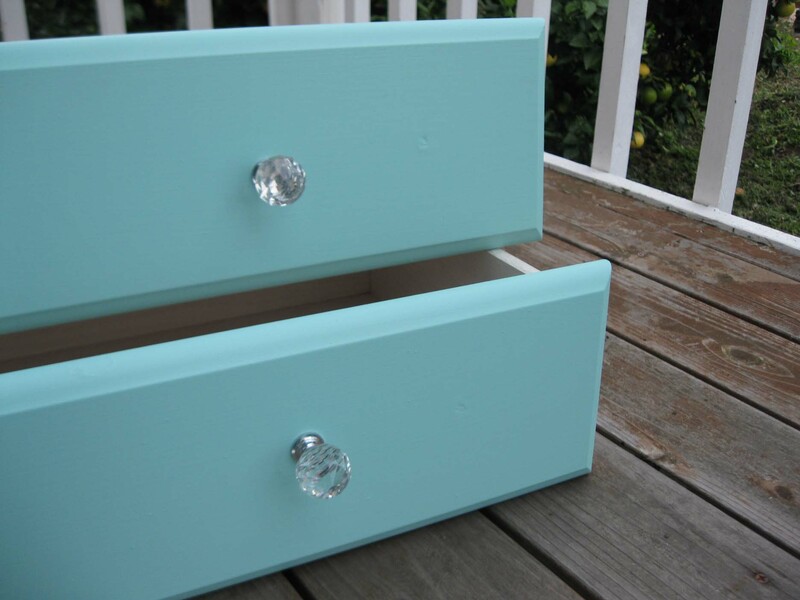 I put wood putty over the extra holes in the front of each drawer, and then I painted them. Sean built a shelf into the empty space where the missing drawer would have gone. 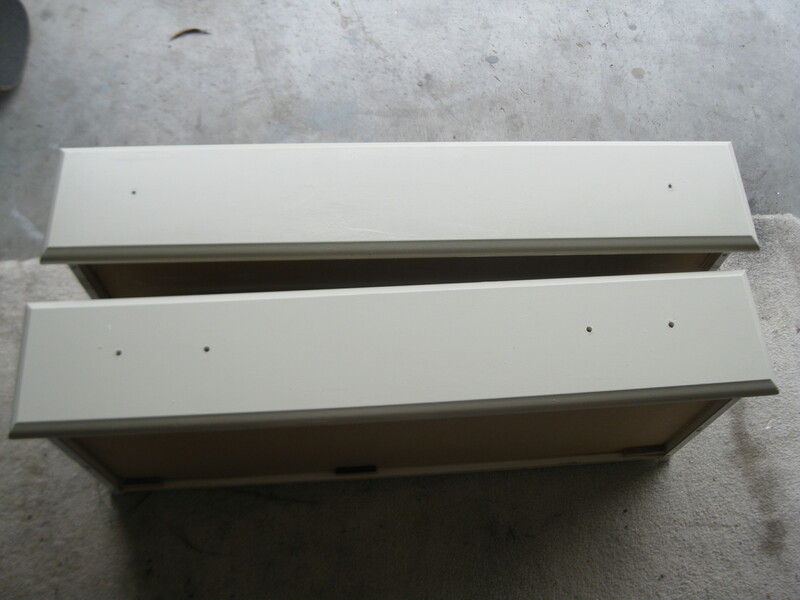 He also drilled a couple of new holes into the top drawer for me. Empty, hollow, and a little sad. … and waiting to dry. 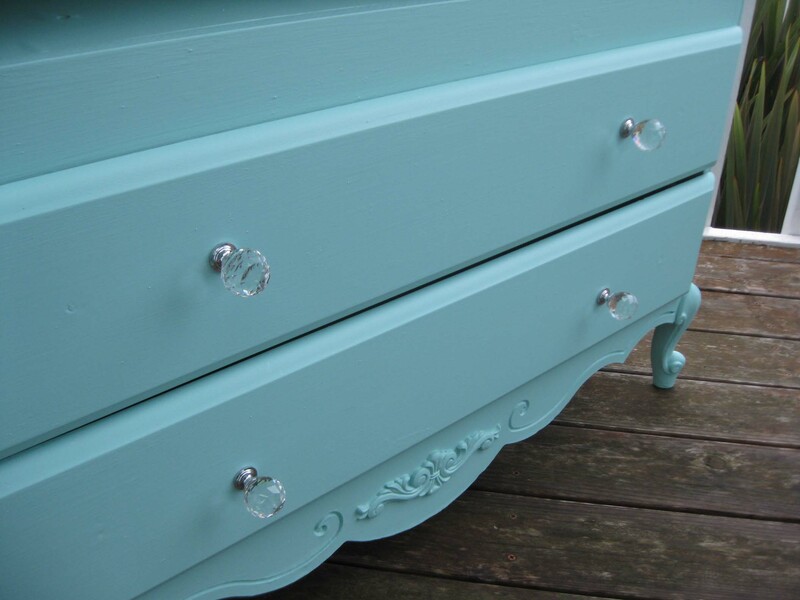 I was hoping for a nice sunny day today where we could carry the bureau out to the backyard for a pretty photo shoot. Of course it was overcast all day and rained instead. At about 5 PM, I’d had enough waiting and decided to take photos on the front porch, clouds and rain be damned. It did sprinkle a little, but I think the bureau did a nice job posing for the grand reveal. 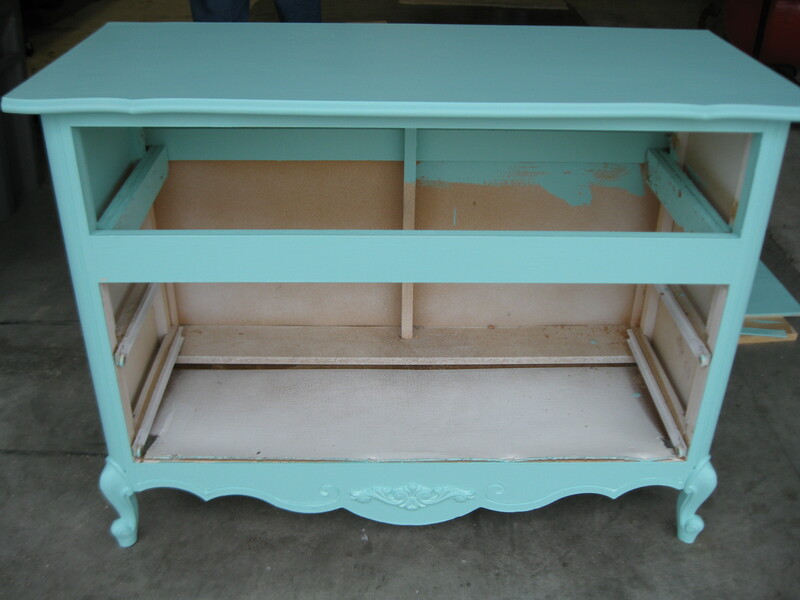 I think it would make a great credenza for the TV, DVD player, and DVDs. 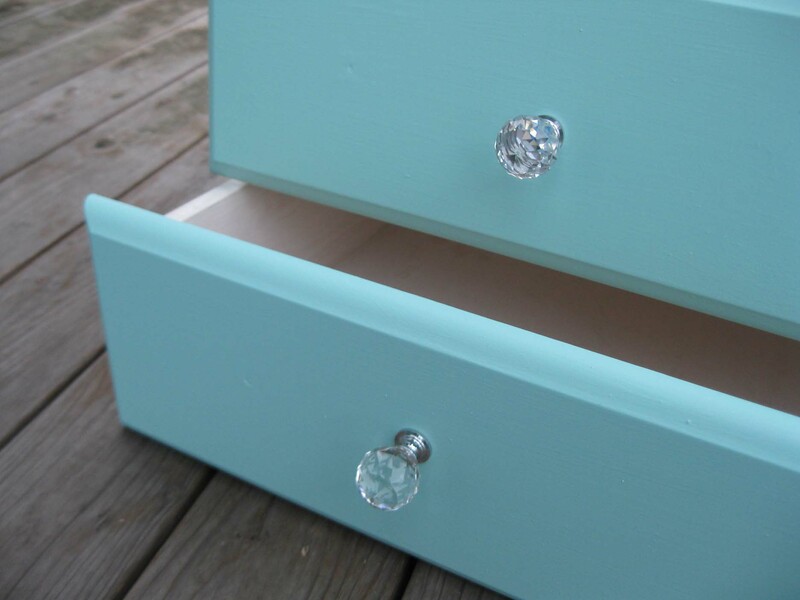 It would also look great in my craft room where I store my yarn and fabrics. Either way, I’m pretty pleased with how it turned out. It’s got me thinking of doing a lot more trash picking and upcycling. Stay tuned! 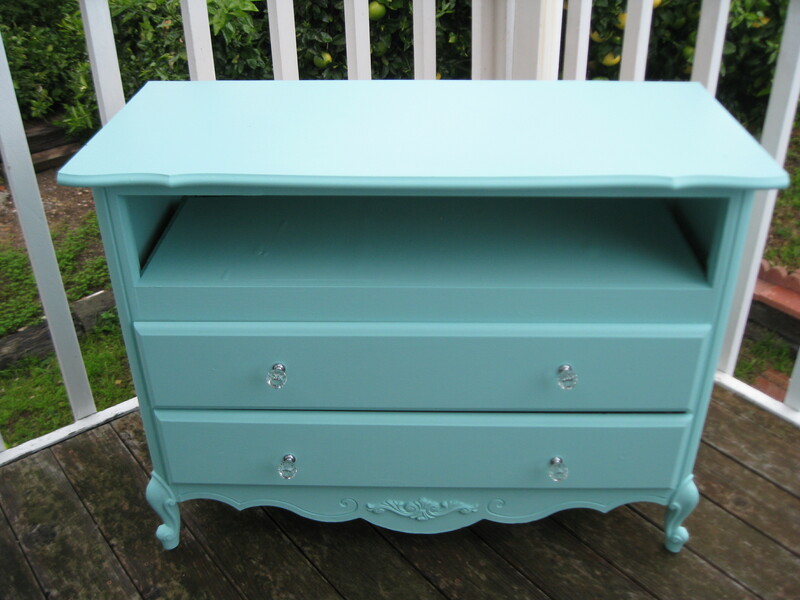 Categories: Handmade | Tags: beach cottage, bureau, credenza, furniture makeover, Morro Bay, Sean, Shabby Chic, upcycling | Permalink. Some days I have a really hard time coming up with a good title for the daily blog post. Today was not one of them. So, as you recall, on Saturday I went trash picking and on Sunday I got to upcycling. 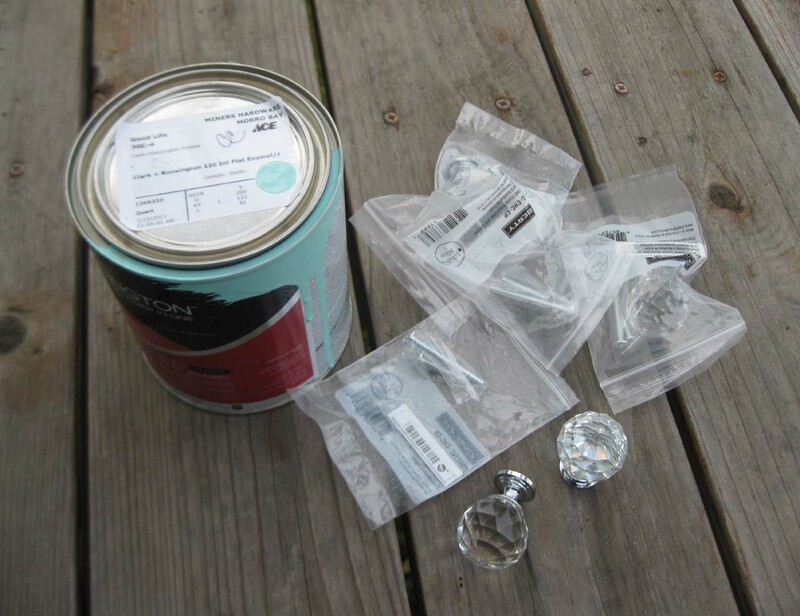 I forgot to mention yesterday that part of the day’s activities included going to Ace Hardware for paint and Home Depot for replacement knobs for the dresser drawers. They were stripped of their knobs when I rescued them from the trash. 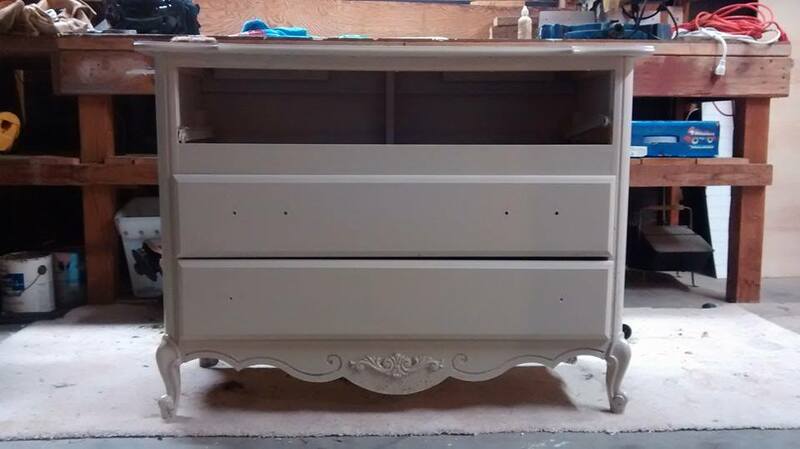 You can click on the photo for an enlarged view, but you can see where the holes were drilled for the drawer knobs. Apparently, the top drawer had two knobs, while the second drawer probably had two handle-type pulls. I didn’t like the placement of holes in the top drawer. So I used some of Sean’s wood putty and filled the extra holes that I planned to paint over. Then Sean took his drill, measured the spots for the new holes, and drilled them in for me. 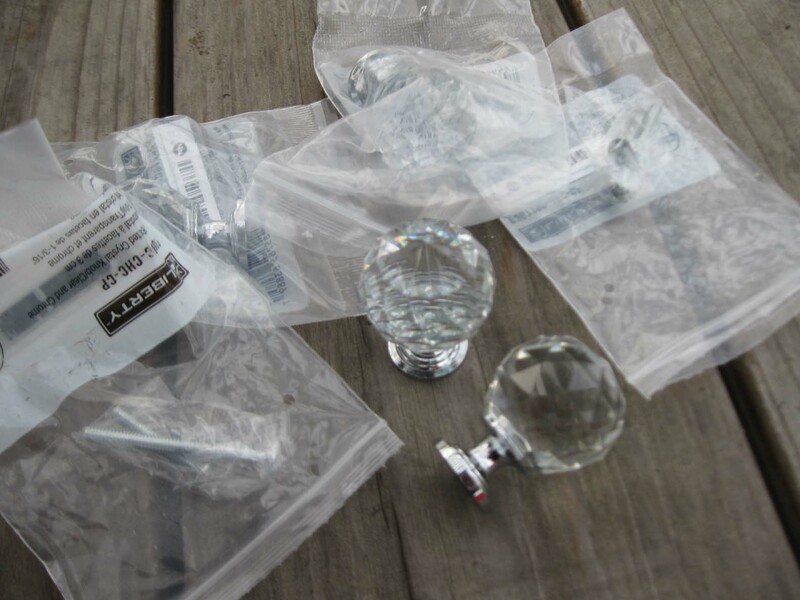 I knew I wanted glass knobs for that vintage shabby-chic look, and I found exactly the perfect ones. They’re faceted crystal, and they remind me of disco balls, the way the light bounces off into rainbows. At six dollars a knob, these were the most expensive purchase for this makeover. Costly, but oh so pretty! 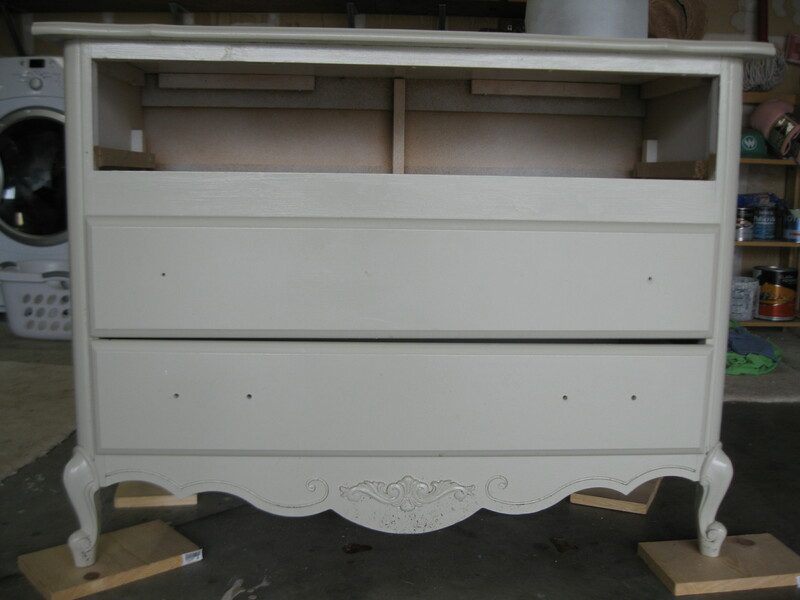 I gave each dresser drawer two coats of paint, and that seemed like enough. 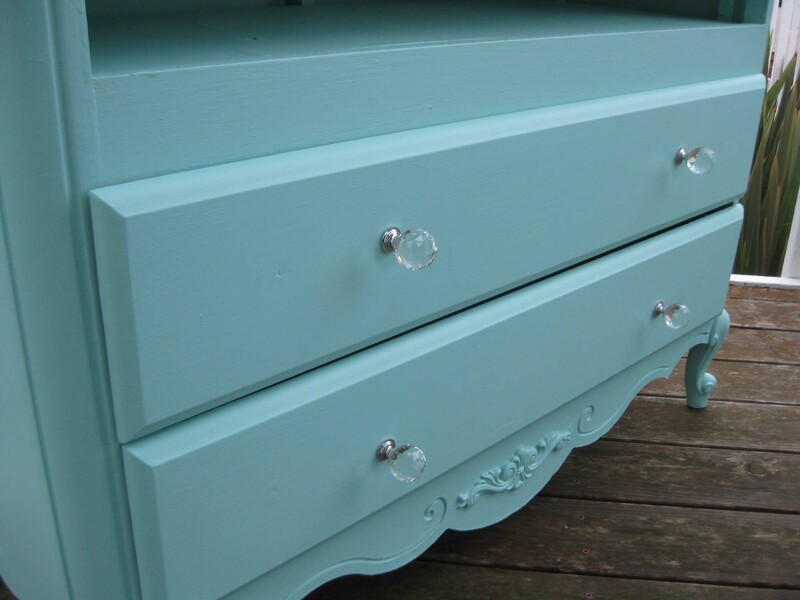 When the paint dried, I had the pleasure of installing my new glass knobs. Sean is back down in Ventura now, and I’ll be headed down there for this weekend. It’s still foggy in Morro Bay, so I’m going to wait until we’re both up here on a sunny day to take more photos of the completed project. Stay tuned for the Big Reveal in probably two weeks! 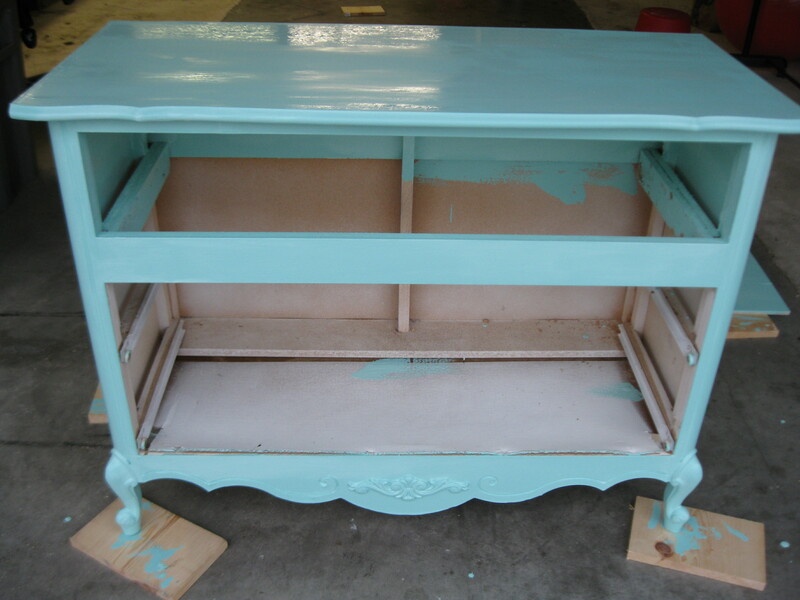 Categories: Handmade | Tags: beach cottage, bureau, credenza, Shabby Chic, upcycling | Permalink. 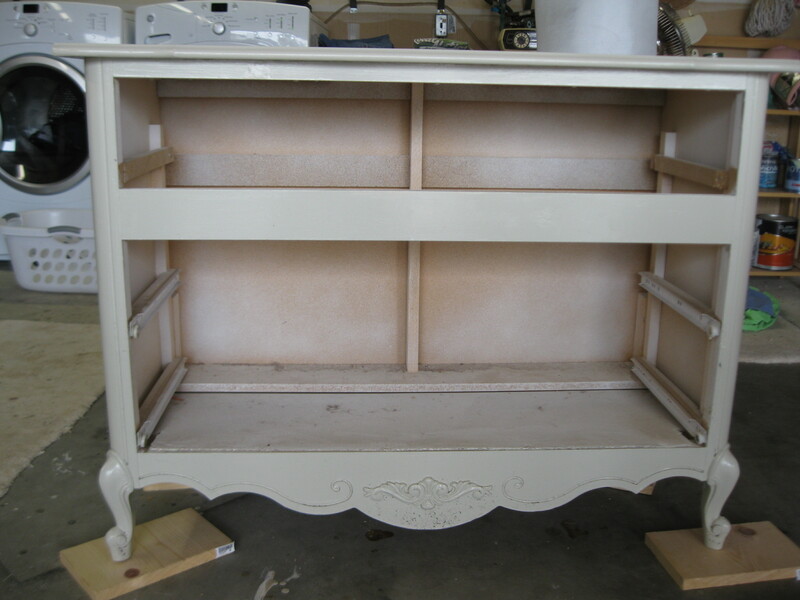 Remember this old bureau that I rescued from the landfill yesterday? I spent most of today fixing it up, with Sean’s help. Click for a closer look of the dirty, dusty details. 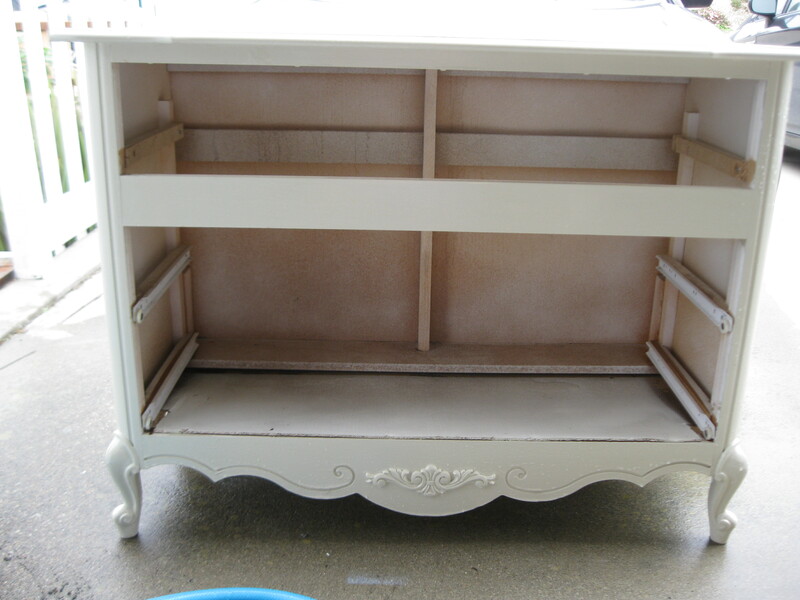 First, I pulled out the two remaining drawers and discovered dust and a spider and a few other tiny bugs and crawlies. So Sean and I carried the empty dresser out to the driveway, where I gave it a major powerwash with the garden hose. Sean got started measuring the space where I wanted a shelf, since one of the three drawers had been missing its front panel and was beyond repair. In the meantime, I started painting. I went with two coats and thought that was a good place to stop. It was foggy in Morro Bay today, so it wasn’t the best day to be taking photos in natural sunlight. But I think you can get a pretty good idea of where this project is heading. P.S. The name of this paint is Good Life. Which is kinda appropriate, ’cause that’s what we’re living, baby. Categories: Adventures with Sean, Handmade | Tags: beach cottage, bureau, credenza, Morro Bay, Shabby Chic, trash picking, upcycling | Permalink. Sean and I were taking a shortcut to the Embarcadero by way of a side street off Main. We were passing a parking lot of a commercial building when I noticed some furniture that had been put out near the dumpster. 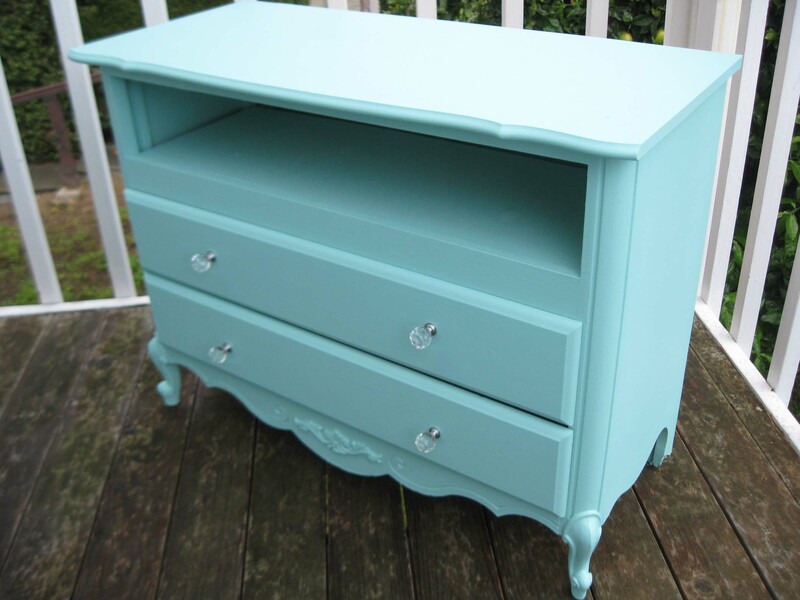 “Hang on,” I said to Sean and ran across the parking lot to check out the furniture—or more specifically, a bureau that caught my eye. It had exactly the kind of curves that I like. At the same time, the front panel of the bottom drawer was missing, along with every single drawer knob. Still, it had potential. I could remove the broken bottom drawer and rearrange the remaining two drawers so that the top section could be an open shelf. So Sean, being The Most Patient and Best Husband in The World, went along with my plan and we walked back up the hill to our house. Then we got in The Rental and drove a half mile back to the dumpster in the parking lot, only to discover (when I went to lift one side) that the bureau was coated in grime and filth, and there was no way that The Most Patient and Best Husband in The World was going to agree to slide that dirty old bureau onto the clean carpeted trunk of his car. So we got back in The Rental and drove the half mile back up the hill to our house, where I ran into the garage and grabbed a bunch of rags and an old bedsheet, and then we drove back down the hill to the commercial building’s parking lot, and this time we successfully loaded the bureau into the back of the car. The Most Patient and Best Husband in The World drove us back home and unloaded the bureau into the garage. 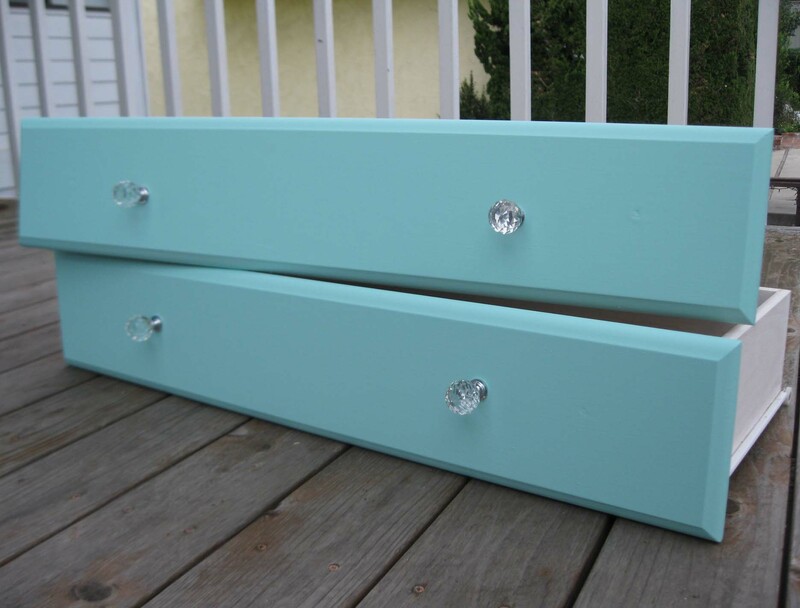 “Okay,” I said, already thinking about my paint color choices and whether I should go for Shabby Chic off-white or Beach Cottage aqua/turquoise. I also thought it best not to say any more, because I was still going to need his help to get the job done. Someone’s going to have to build a shelf in that space where the missing drawer should be. 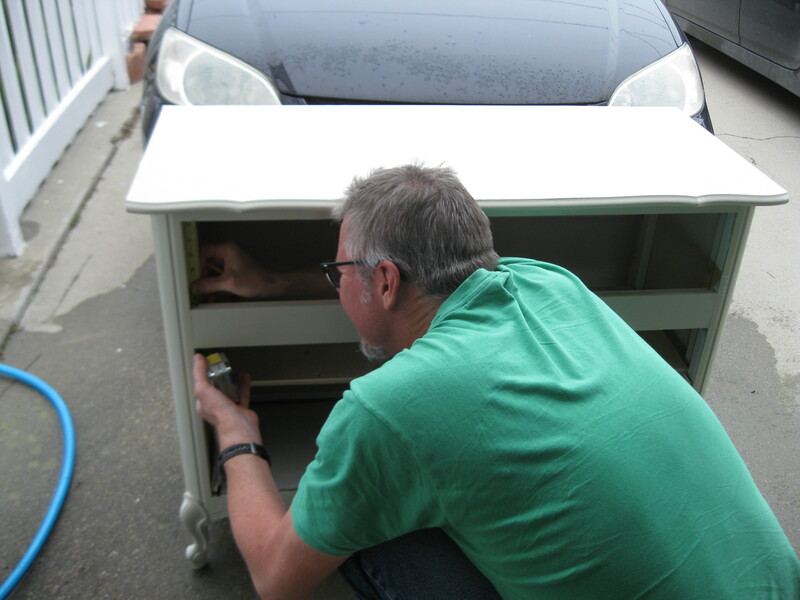 Categories: Adventures with Sean, Handmade | Tags: bureau, credenza, furniture makeover, Morro Bay, Sean, trash picking, upcycling | Permalink.